Pretty cool right? Using the slider, you get a sense of how the countries priorities have changed over time — for example, in 1987, at the tail end of the Cold War, defense spending was much higher — and also the tremendous burdens that Medicare and Social Security have become. But as we mentioned above, the chart is really meant to be inspiration. 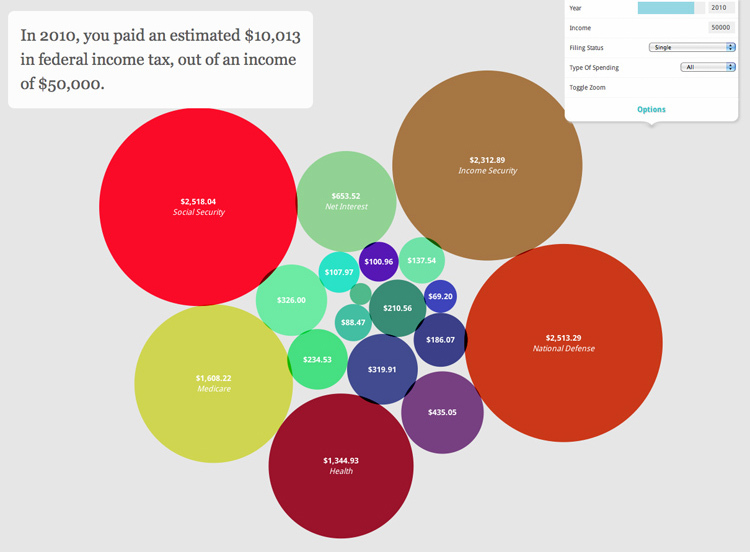 Drawn from WhatWePayFor.com, it gives you just an inkling of the vast data set available — and, more interestingly, suggests all sorts of challenges a tax visualization could meet. What should we care about most in our tax policy? 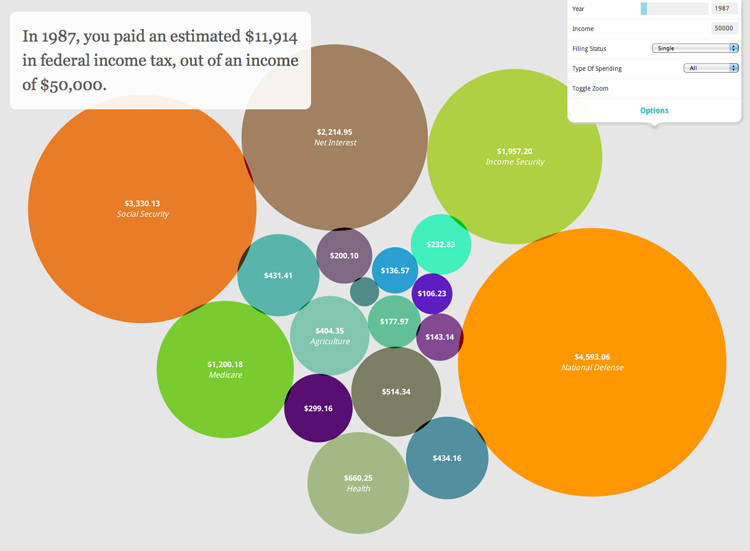 How can a simple tax chart surprise and delight? The competition itself was inspired when Aaron Koblin, a data viz wunderkind at Google Creative Labs, stumbled across WhatWePayFor.com, and marveled at how much better the data could be presented — and how important the data was. Storytelling: Uses narrative, point of view, or tone to tell a persuasive story. Clarity: Presents information that is accessible, accurate, and meaningful. Relevance: Communicates information that is timely, personal, or relatable. Utility: Provides insights that can inform action. Aesthetics: Embodies beauty, balance, and visual originality. Please enter! As part of the steering committee and judging panel, we’ll be watching.